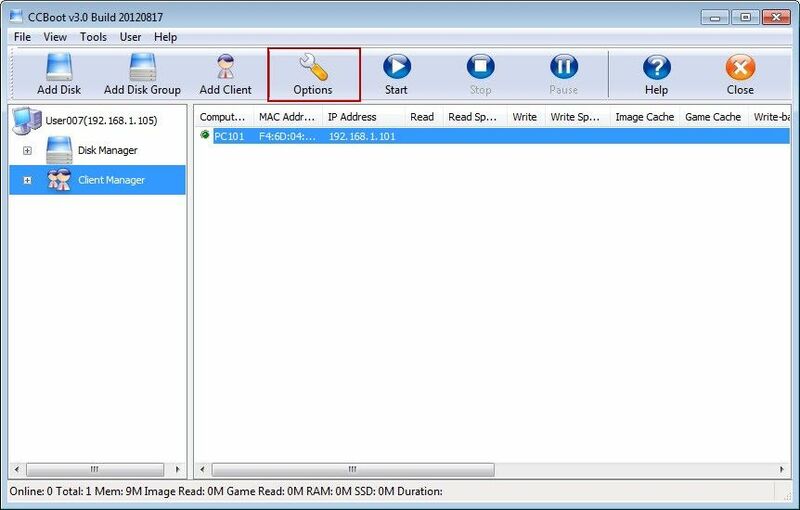 There are two network cards and two different LAN environments (LAN A and B) in the server. NIC A works in LAN A, and the IP is 192.168.1.254, and the gateway address is 192.168.1.1. NIC B works in LAN B, and the IP is 192.168.0.254, and the geteway address is 192.168.0.1. The settings of CCBoot server are as follows. 1) Set the configuration parameter of CCBoot LAN A, and then take a client of LAN A (eg. 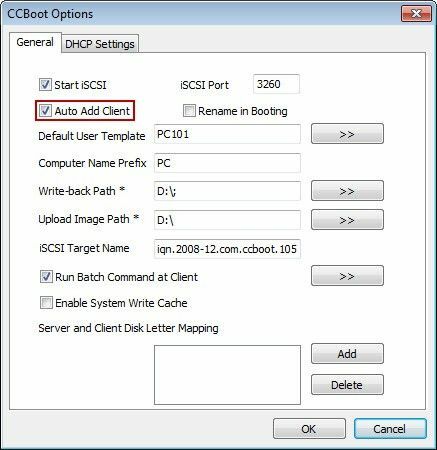 PC101) as a "default user template"
2) Then, start the client of LAN A in order, number the client in CCBoot and add it to its users list, and the client takes effect only to the new added ones after setting the default user template. The operate steps are as follows. 1) Click "Options" on the toolbar of CCBoot’s main interface (Figure 1‑1). 1) Select "Auto Add Client" in the check box when pop-ups the dialog box "CCBoot Options" (Figure 1‑2). 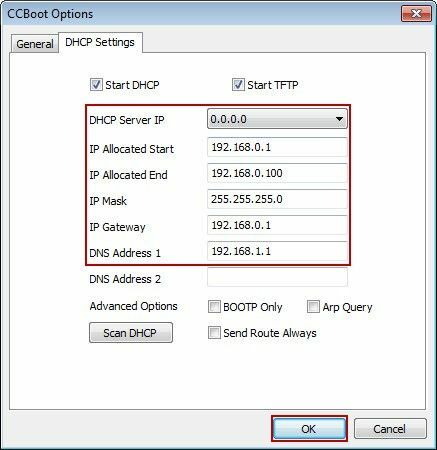 2) Select "DHCP Settings", and choose "0.0.0.0" in the combo box "DHCP Server IP". 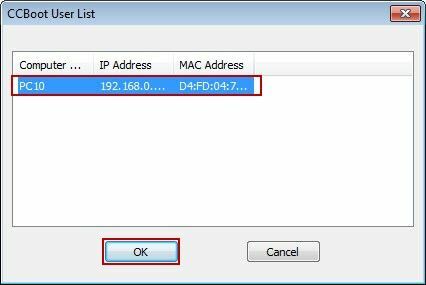 Then input the initial address "192.168.1.101" and "192.168.1.254" of LAN A to the edit box of "IP Allocated Start" and "IP Allocated End" (Figure 1‑3). 3) Click "Client Manager" on the main interface of CCBoot. And double-click a client (like PC101) in the details pane. 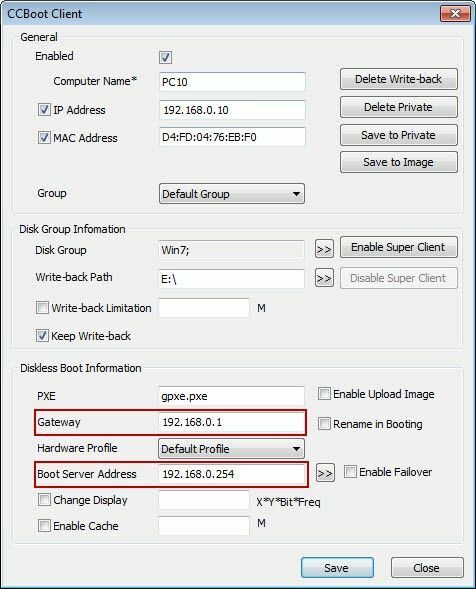 4) Input the CCBoot server IP 192.168.1.254 of LAN A to the edit box "Boot Server Address" in the dialog box "CCBoot Client", and input 192.168.1.1 to the "Gateway", then click "Save" to store this information (Figure 1‑4). 5) Click "Options" on the toolbar of CCBoot’s main interface (Figure 1‑5). 6) Click the button ">>" which exists in the right side of "Default User Template" when pop-ups the dialog box "CCBoot Options" (Figure 1‑6). 7) Select "PC101" in the dialog box of "CCBoot User List", and then click "OK". Finally, click "OK" in "CCBoot Options" to save this setting (Figure 1‑7). 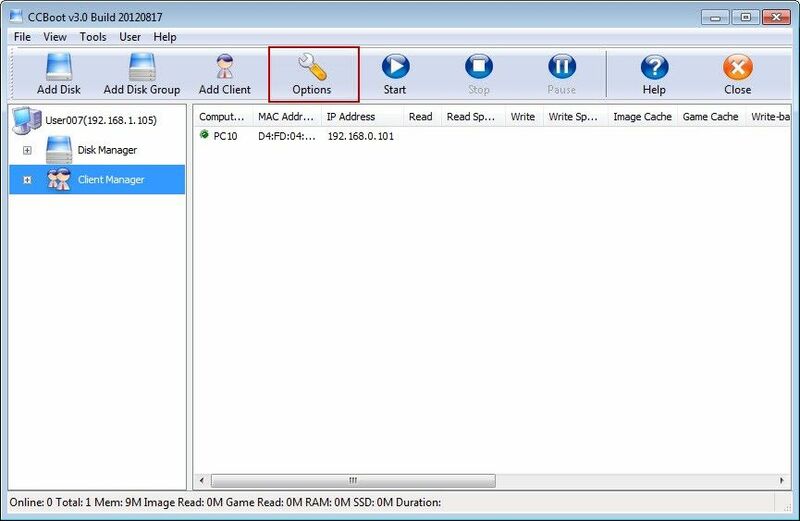 8) Gradually start the machine in LAN A, number the CCBoot server client and add it to the user list. 9) All of the clients of LAN A can start to work when the above operations are finished. 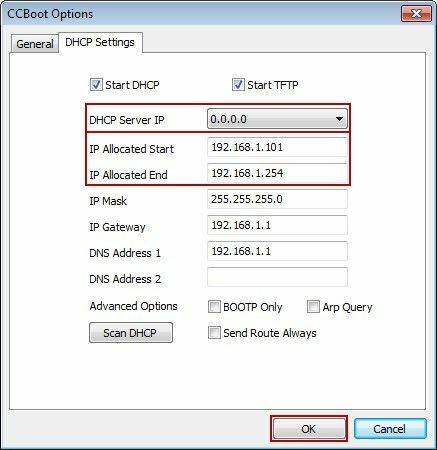 1) Select "DHCP Settings" in the dialog box "CCBoot Options", and choose "0.0.0.0" in the combo box "DHCP Server IP". Then input the IP address "192.168.0.1" and "192.168.0.100" of LAN B to the edit box of "IP Allocated Start" and "IP Allocated End". And also input "192.168.0.1" to "IP Gateway", and then click "OK" to save this information (Figure 1‑8). 2) Click "Client Manager" on the main interface of CCBoot. And double-click a client (like PC101) in the details pane. 3) Input the CCBoot server IP 192.168.0.254 of LAN B to the edit box "Boot Server Address" in the dialog box "CCBoot Client", and also input 192.168.0.1 to the "Gateway", then click "Save" to store this information (Figure 1‑9). 4) Click "Options" on the toolbar of CCBoot’s main interface (Figure 1‑10). 5) Click the button ">>" which exists in the right side of "Default User Template" when pop-ups the dialog box "CCBoot Options" (Figure 1‑11). 6) Select "PC10" in the dialog box of "CCBoot User List", and then click "OK". Finally, click "OK" in "CCBoot Options" to save this setting (Figure 1‑12). 7) Gradually start the machine in LAN B, number the CCBoot server client and add it to the user list. 8) All of the clients of LAN B can start to work when the above operations are finished. In this way, we can achieve to serve two LAN machines by using a CCBoot server‘s two NIC.